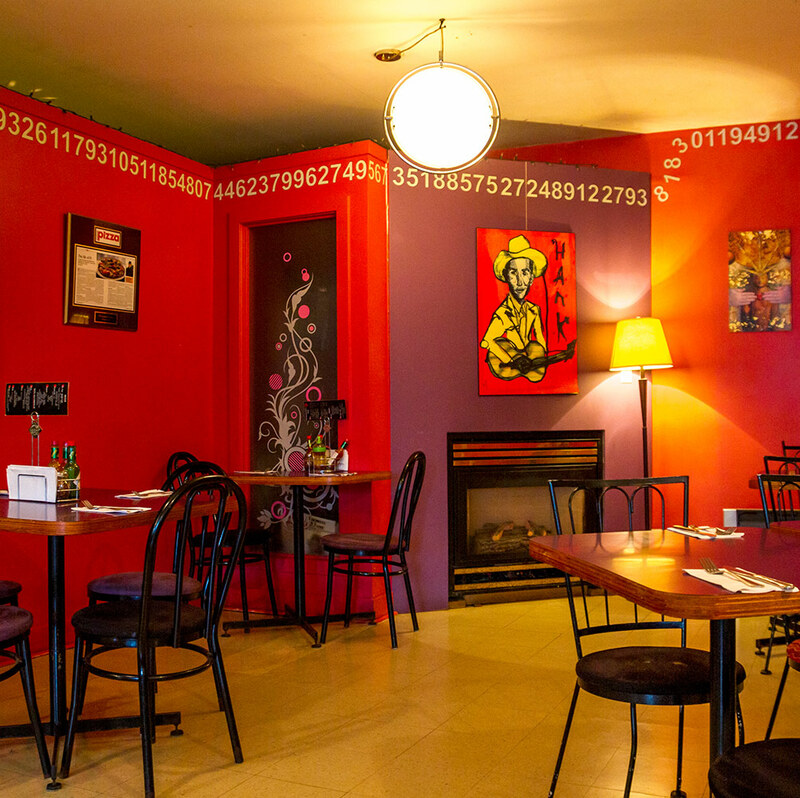 Established 2008, Pi is the first gourmet pizza restaurant in St. John's and continues to offer world class pizza. Specializing in Neapolitan style pizza fusing old-world charm with contemporary tastes, our thin crust pizza is made with vegan friendly dough and of course the freshest ingredients. Over the years we have become world pizza champions being awarded #1 in the non-traditional category in 2014 at the Las Vegas Pizza Expo. The " Vegas Special " is featured on our menu. 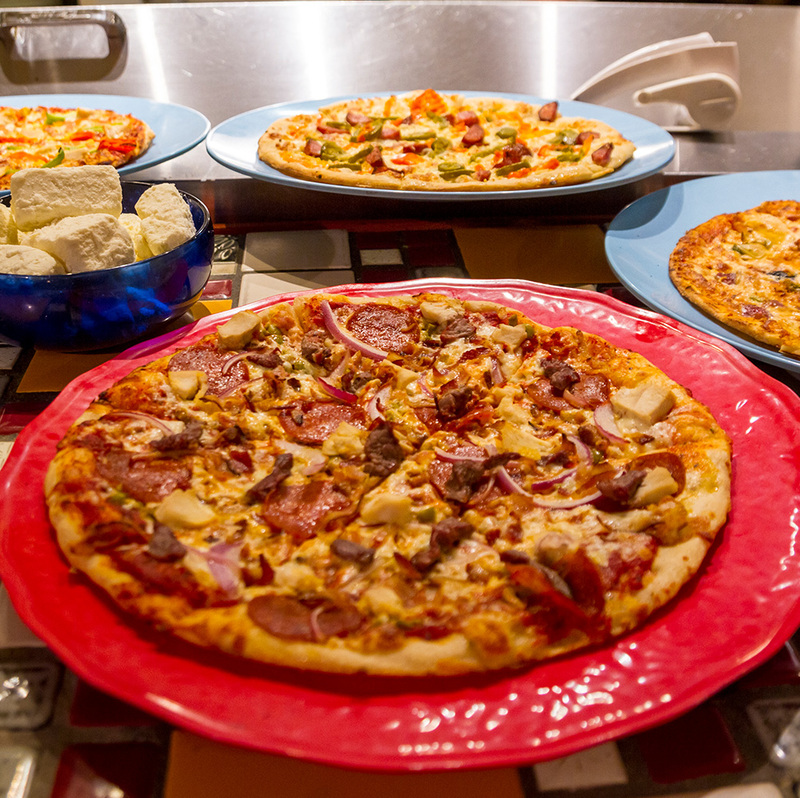 Catering to many dietary restrictions and allergies, we offer gluten free dough and vegan cheese. You can build your own or choose from our menu! 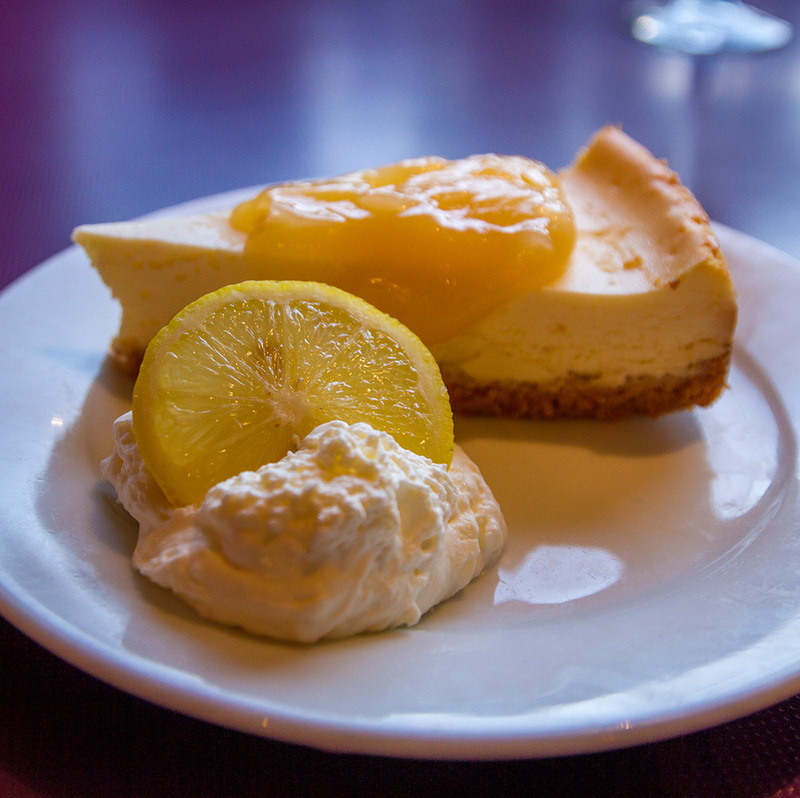 Desserts and soups are made fresh in house. Quidi Vidi beers are on tap alongside a selection of wines and craft beers. 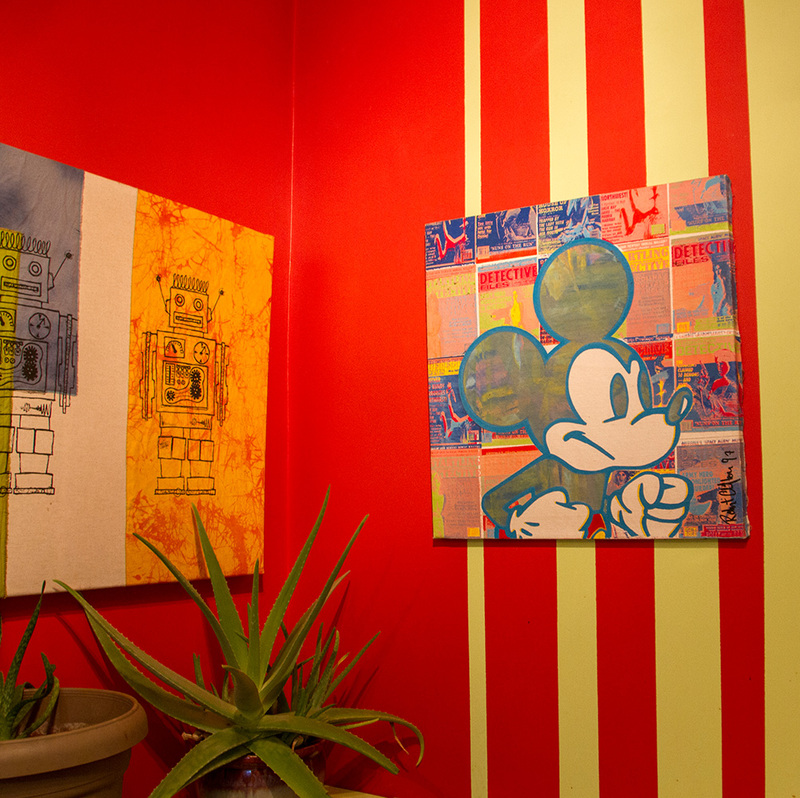 Visit us for lunch or dinner. Dine in or dine out. Reservations are encouraged. An herb tomato base with your choice of our italian cheese blend or soya cheese. Enjoy it plain or add toppings of your choice. A herb tomato base topped with spinach, fresh tomato, fresh basil leaves and brie. Our margherita pizza! A mediterranean vegetable base topped with baby spinach, grilled zucchini, fennel slices, sun-dried tomatoes, roasted garlic, italian blend + feta or soya. Artichoke hearts, grilled zucchini, red onion, sliced black olives, cherry tomatoes and toasted almonds on your choice of and olive oil + garlic or herb tomato base. A roasted garlic and olive oil base topped with compote of caramelized pear and red onion braised in port, baby greens, toasted walnuts and gouda cheese. A creamy red wine tomato base topped with sun-dried tomatoes, portobello mushrooms, baby spinach, red onion, black olives and italian blend + parmesan. A creamy tomato base topped with grilled asparagus, red grapes, sliced brie, bacon, italian blend and parmesan cheese. A pesto base topped with roasted chicken, sun-dried tomatoes, bacon, red onion, hot banana peppers, italian blend and parmesan. A pesto base topped with prosciutto ham, artichoke hearts, red onion, sliced black olives and pineapple chunks. A curry infused tomato base topped with chicken, sweet corn, green peppers, hot banana peppers and fresh tomato. A sun-dried tomato and avocado cream cheese base topped with smoked salmon, sweet potatoes, red onion, fresh tomatoes and feta + italian. A herb tomato base topped with pepperoni, green peppers, mushrooms and fresh tomatoes. 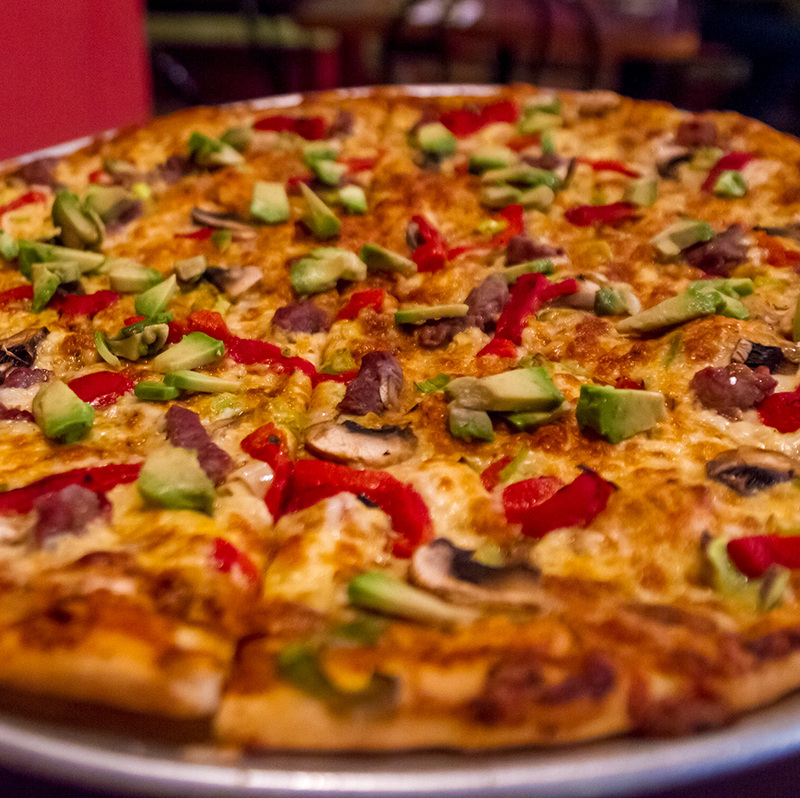 A pesto tomato base topped with shaved steak, roasted red pepper, mushrooms, avocado slices and leeks. A pesto base topped with shaved steak, red onions, mushrooms, sun-dried tomatoes, hot banana peppers and feta + italian. A black olive tomato base topped with pepperoni, bacon, shaved steak, chicken and red onion. A herb tomato base topped with smoked salmon, red onion, fresh tomatoes, capers and feta cheese. A herb tomato base topped with hot italian sausage, bacon, mushrooms, red onion and fresh tomatoes. 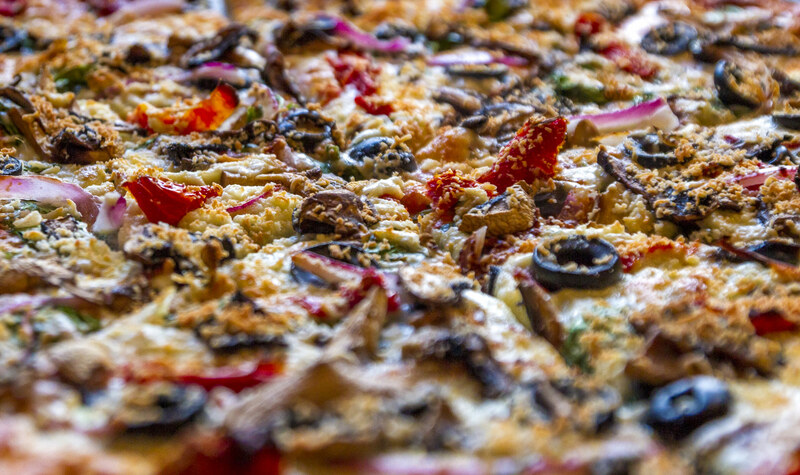 A sesame seed crust with a teriyaki base topped with shaved steak, green peppers, red onion, portobello mushrooms and italian blend + parmesan. A habanero-orange infused tomato base topped with baby spinach, roasted red pepper, red onions, chicken and pineapple chunks. An olive oil garlic base topped with baby greens, leeks, minced hot peppers, pear and onion compote, bacon and feta. A tomato base with spinach, red onion, fresh basil leaves, homemade Italian meatballs and mozzarella cheese. A thin crust italian turnover with tomato sauce and our italian cheese. Add any topping for + 1.75 $. 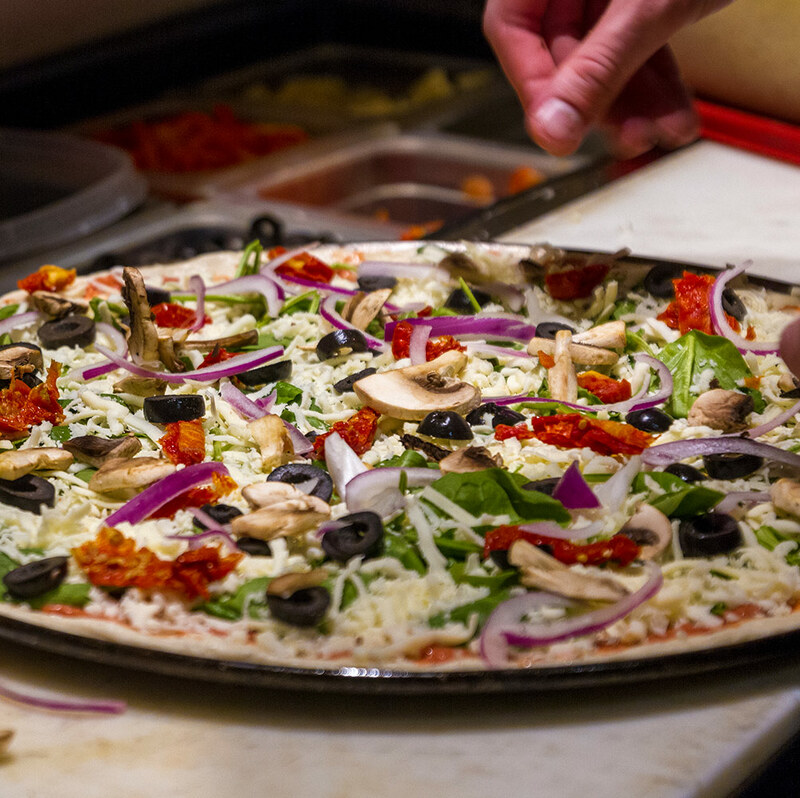 Always homemade, always fresh, be sure to ask your server for today’s creation. Comes with a slice of our homemade bread (make that garlic cheese bread for +1 $). Three slices of our homemade bread baked with olive oil + garlic and our italian blend cheese (though we can switch that to soya for you). Homemade italian flat-bread baked with pesto and parmesan. Served with balsamic vinaigrette. A warm cream cheese dip with chives and garlic topped with prosciutto ham and baked with parmesan cheese. Served with our homemade bread. An italian flat-bread baked with olive oil + garlic and italian blend cheese then cut into strips with our homemade sun-dried tomato dip. A blend of button + portobello mushrooms with red onions sauted in a white wine and herb sauce on a bed of spinach + feta atop our crostini. Artichokes, leeks, sun-dried tomatoes, green olives and green pepper sautéd in white wine with garlic and fresh herbs then topped with feta cheese. Served with a basket of our focaccia bread. Our classic caesar with fresh romaine lettuce, slices mushrooms, oven roasted croÃ»tons in our lemon parmesan dressing and topped with fresh parmesan. Artisan lettuce blend with sliced cucumber, green onions, and toasted almonds drizzled with our citrus pomegranate molasses vinaigrette. Artisan lettuce blend with sun-dried tomatoes, grapefruit, roasted chicken and mixed seeds, drizzled with a red tarragon feta vinaigrette. 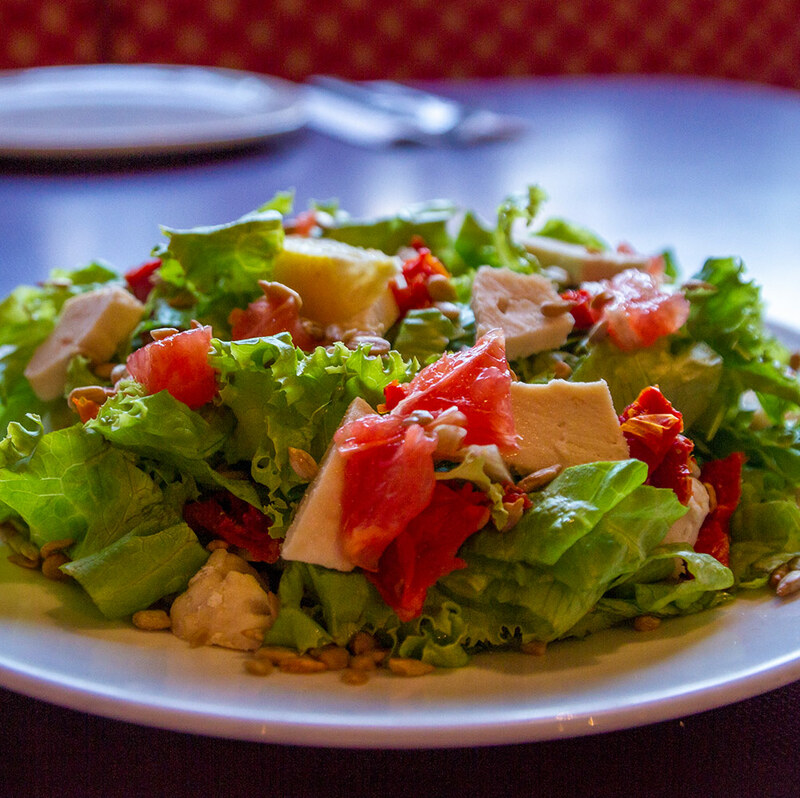 Artisan lettuce blend with green peppers, red onion, artichoke hearts, olives and fresh parmesan, drizzled with our house mediterranean dressing. All of our pastas come with our homemade bread toasted with olive oil + garlic. Add cheese to said bread for +1 $. Sauted artichokes, red onion, leeks, zucchini and mushrooms with cheese tortellini in a thick artichoke cream sauce and baked with feta cheese. An egg yolk garlic cream sauce with sauted bacon, red onion, artichokes and mushrooms on linguine. Sauted roasted chicken, green peppers, sun-dried tomatoes, red onions and mushrooms tossed with your choice of linguine or cheese tortellini in a pesto cream sauce. Smoked salmon, artichoke hearts, mushrooms red onion, and fresh tomatoes sauted in a red wine tomato sauce tossed with linguine pasta and baked with feta. A spicy rose cream sauce with bacon, mushrooms, green pepper, red onion, artichoke hearts and fresh tomatoes on a bed of cheese filled tortellini. Our pasta tossed in a parmesan cream sauce with a hint of garlic. 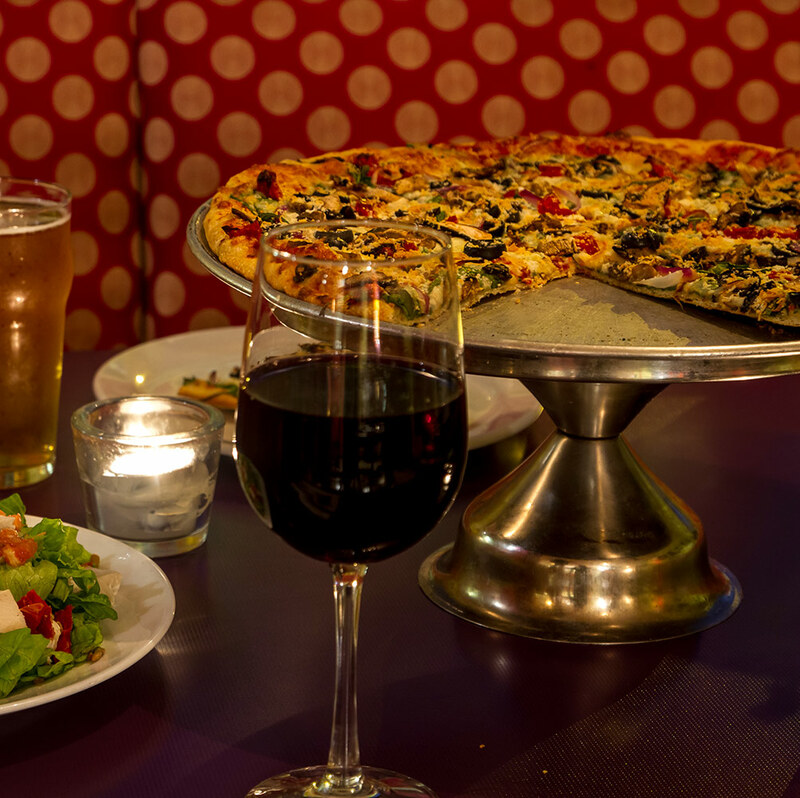 Sauted spinach, mushrooms, red onion, olives, sun-dried tomatoes and artichoke hearts tossed with linguine and your choice of sauce. A warm soft pudding cake spiced with hints of ginger and served with a hot rum sauce. A dense cocoa cake with a thick rich chocolate-kahlua ganache. A dense fudge cake without the guilt! A rich cream cheese filling with a coconut graham cracker bottom. flavors be changing so be sure to enquire! A variety of assorted fruits blended in hints of spice with a crisp brown sugar and oatmeal top! again, ask your server which fruits were involved. Ask for the daily goodness!